Drawing Board A1 Budget Barcode 5060192090314 Budget Desktop/Portable Drawing Boards have a two position support bar which provides a comfortable working/drawing angle of 20 degrees. When folded flat the dual purpose support bar provides a convenient handle for comforable carrying. This inexpensive drawing board has a stylish P.V.C.edging and impact resistant drawing surface for hard use environments. It is supplied with the cross wire parallel motion which provides consistent accuracy and a smooth operation. The professional straightedge is reversible, having one clear plastic drawing edge and one metal cutting edge. 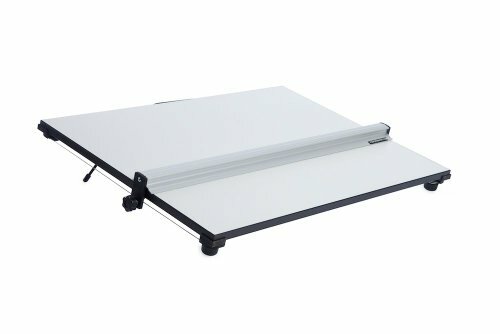 Due to there solid construction and excellent value for money, these drawing boards have become a popular choice among school and college students. Product comes Fully assembled and ready to use. If you have any questions about this product by JRB, contact us by completing and submitting the form below. If you are looking for a specif part number, please include it with your message.